Well I have a little fur ball that somehow came to me a few months after I moved here. My mother had a coworker whom had a cat they found, that they could no longer keep. So since I was always home, I could baby sit a fur ball. It turns out he was found as a young kitten and the couple whom had him had multiple dogs. So he has taken the mental appearance of a dog, besides the look of a cat....there is no cat inside that brain.. He still has the instincts of a cat, but has no idea how to use them or what these feelings are meant for. The door opens and he runs out side like a wild dog, the kitty instincts kicks in when he sees a bird or should I say its the curious factor that all cats have. So he disappears, getting him back in is a big chore as with a dog, he loves to be chased and this is tons of fun when your running around the neighborhood calling Oscar. It took me some time to get him to accept catnip, first he only wanted the bag stuff then I slowly got him into the fresh stuff. I then see like a normal kitty he doesn't roll around in it, instead he eats it...and yep like stoner his eyes get HUGE and looks like one of them big eye paintings from the 70s. 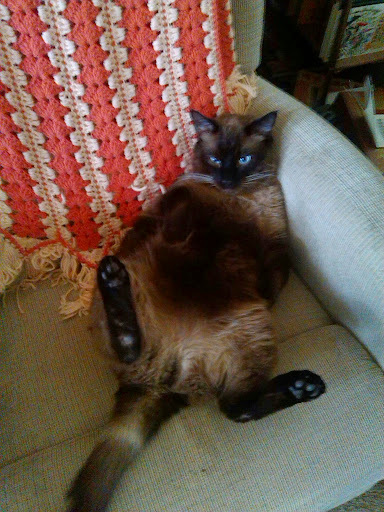 Oh if you cannot tell, he is a Siamese and yes we have had issues with manage. Must keep him clean as his skin is soooo sensitive, I use to be able to give him a bath and he was okay with that. But now in his older age, he acts as though we are attempting to boil him....so so so much fun! !